Make Scrapbooks, NOT dinner. : ICE CREAM TRUCK!! YUM!! They sure did love this - ALL of them! Heather - we know you would love to be at all the things, but can't because of your life there in Columbia. Some of us would love to be where you are at, too though - so if you ever feel like we are hanging things over your head from here in the states, be sure to remind us that not all of us get to live where you are living and learn all the things you are learning. 8-) Trying to help ya, not sure I did though. I understand, Dawn. I'm sorry about all of it. Love ya! Looks like they're having fun! Mollie wanted to know where they got their ice cream. She gets all excited anytime she hears the ice cream truck coming down the street. Not that she gets something every time - but it is a nice treat every now and then! 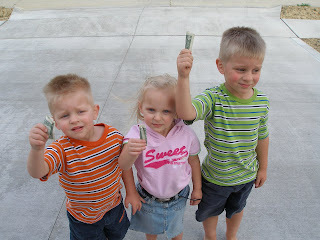 I miss the icecream truck! We haven't seen one around here! The kids are sooooooo... cute! Hope you got a lot of R&R at the retreat! 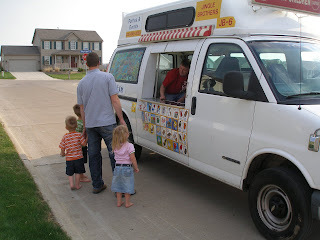 When Phillip pastored in AZ, we had icecream trucks that would come by A-L-L of the time...so instead of teaching little Kimberly that that sound meant run for your money and get icecream...I'd just say, "Hear the pretty music?!" and she just thought it was a "Music truck". ;) That worked until U. Andrew and A. Vonnie came for a visit...then Kimberly learned the truth. HA! Yes, your comment did help me...we are blessed to get to speak 2 languages and experience life in another country. Well said. Hi, Myranda. Thanks for stopping by and saying hi. You did state what I think a lot of us feel. I think about Melodie and Heather a lot. 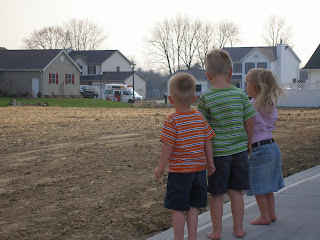 They are missed so much and prayed for often. 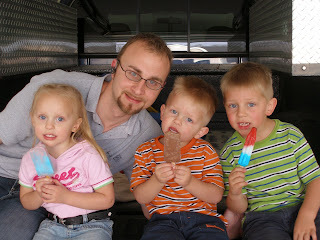 Very cute pics demonstrating classic American Ice Cream Truck Syndrome. Thanks to everyone who's thinking of Heather and me while we are so far away. It means a lot - at least I know it does for me. Many times my thoughts turn homeward and I feel lonely, but knowing you are caring and praying for me keeps me going.